The essays and interviews in Numbers and Nerves explore the quandary of our cognitive responses to quantitative information. With contributions by journalists, literary critics, psychologists, naturalists, and activists, this book represents a unique convergence of psychological research, discourse analysis, and visual and narrative communication. Cover photograph: cropped version of "888,246 Red Ceramic Poppies in the Tower of London Moat Representing Commonwealth Soldiers Who Died in World War I" by Kenneth Helphand. Copyright 2015 by Kenneth Helphand. 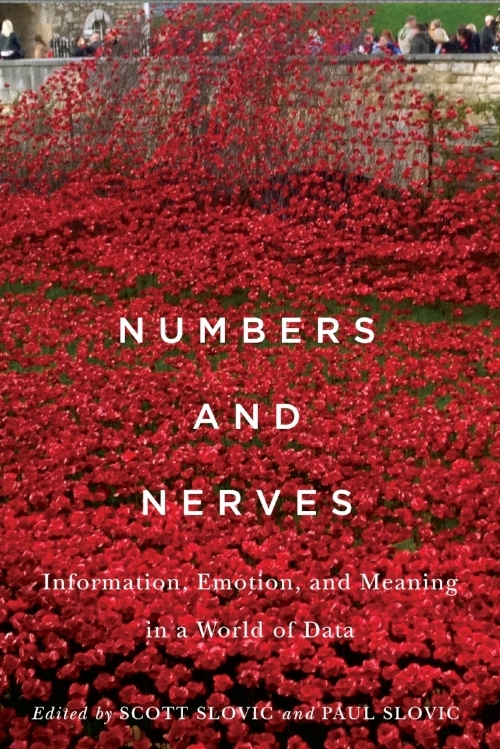 Scott and Paul Slovic’s 2015 book Numbers and Nerves: Information, Emotion, and Meaning in a World of Data focuses on the same themes of the Arithmetic of Compassion website, including psychic numbing, pseudoinefficacy, and prominence bias and how these psychological phenomena impede our ability to confront large-scale humanitarian problems. With contributions by journalists, literary critics, psychologists, naturalists, activists, and others, this book represents a unique convergence of psychological research, discourse analysis, and visual and narrative communication. At a time of unprecedented access to information, our society is frequently stymied in its efforts to react to the world’s massive problems. Many of these problems are systemic, deeply rooted in seemingly intransigent cultural patterns and lifestyles. In order to sense the significance of these issues and begin to confront them, we must first understand the psychological tendencies that enable and restrict our processing of numerical information. In the past two decades, cognitive science has increasingly come to understand that we, as a species, think best when we allow numbers and nerves, abstract information and experiential discourse, to work together. This book provides a roadmap to guide that collaboration. It will be invaluable to scholars, educators, professional communicators, and anyone who struggles to grasp the meaning behind the numbers. Purchase online at Amazon or OSU Press. Contributors: Homero Aridjis, Betty Aridjis, Rick Bass, Annie Dillard, Paul Farmer, Kenneth Helphand, Chris Jordan, Nicholas Kristof, Robert J. Lifton, Marcus Mayorga, Bill McKibben, Greg Mitchell, Robert Michael Pyle, Vandana Shiva, Paul Slovic, Scott Slovic, Sandra Steingraber, Daniel Västfjäll, Terry Tempest Williams, and Zbigniew Herbert.